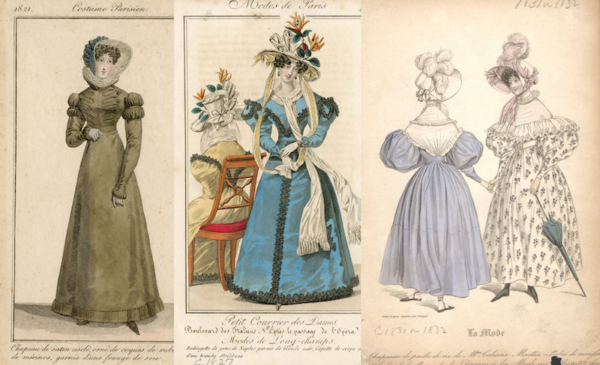 Today we’re going to start our in-depth analysis of the costumes in Wives and Daughters. The book (originally a serial) by Elizabeth Gaskell was published from 1864-66, but it’s set in the early 1830s. 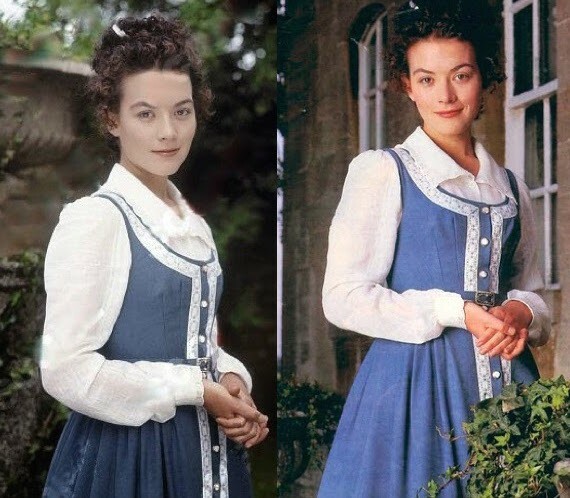 I’m not going to detail every costume worn in the series — if you’re interested, The Dashwood Sisters blog has screencapped every outfit worn by all the main characters in the show — but I do want to talk about how the leads are costumed and how their wardrobes change. Molly is the daughter of a country doctor. She’s middle class, but she lives in a small village in rural England. She’s grown up without a mother, so she lacks a parent who would be hands-on in the wardrobe department — but she also has to play the part of the mistress of the house sometimes, at least early on. She’s a young woman (late teens I think?) who begins as sweet, kind, and dependable but also sheltered and daddy’s girl. She’s also intelligent and a bit shy. Over time, she hangs on to that kindness but becomes more outgoing (through her friendship with step-sister Cynthia) and learns she has a strong resolve. And, she falls in LURVE. Notice how: sleeves get fuller above the elbow, the waist lowers, and the skirts get fuller. 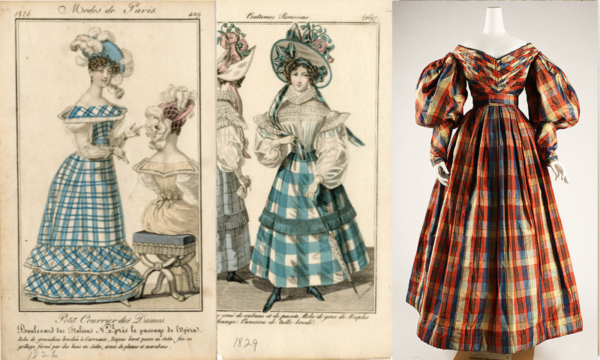 Costume Parisien, 1821 | Modes de Paris, c. 1827 | La Mode, c. 1831 or 1832. The cotton print and short sleeve make this very practical, and the high waistline makes it more late 1820s than early 1830s. Note the lack of accessories like a pelerine or gloves. She wears a LOT of solids. Again, there’s a raised waistline (lower in back) which is a bit dated compared to styles worn by other characters. Notice how the sleeve is pretty narrow — there’s nothing OTT about Molly. 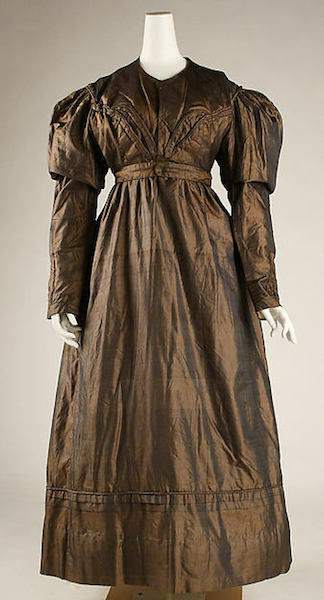 Walking dress, 1821-23, Metropolitan Museum of Art. However, as Molly becomes influenced by Cynthia’s outgoing nature, plus has a new step-mother to fuss over her, AND takes on the role of emotional support for the Hamley family, her wardrobe starts to change. 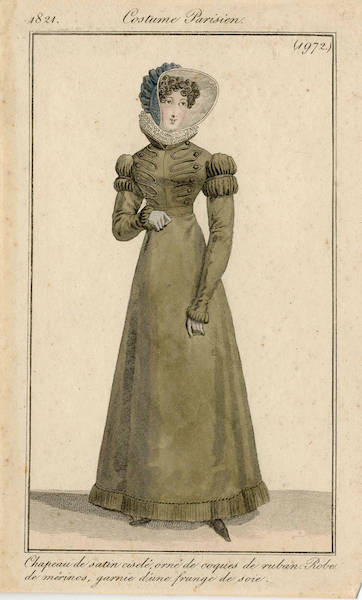 Her waistlines lower and sleeves get bigger — all more fashionable touches for the early 1830s. And, she starts wearing pelerines and other accessories, clearly something her step-mother Hyacinth (who is always dressed to the nines) pushes on her. 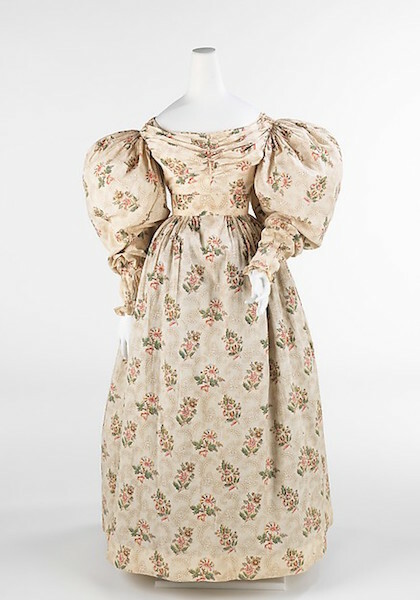 This print dress has fashionable gigot (or leg-of-mutton) sleeves — wide on top, narrow on the forearm. The waist is much lower, and the bodice itself fits much more closely. Compare Molly’s print dress to this original — it has the same natural waistline and very full sleeves above the elbow. Dress, 1832-35, Metropolitan Museum of Art. However, she remains practical whenever she can, as evidenced by her love of jumpers (i.e., a sleeveless dress over a blouse)… which is the one style I question. Has ANYONE seen anything like this in the period? 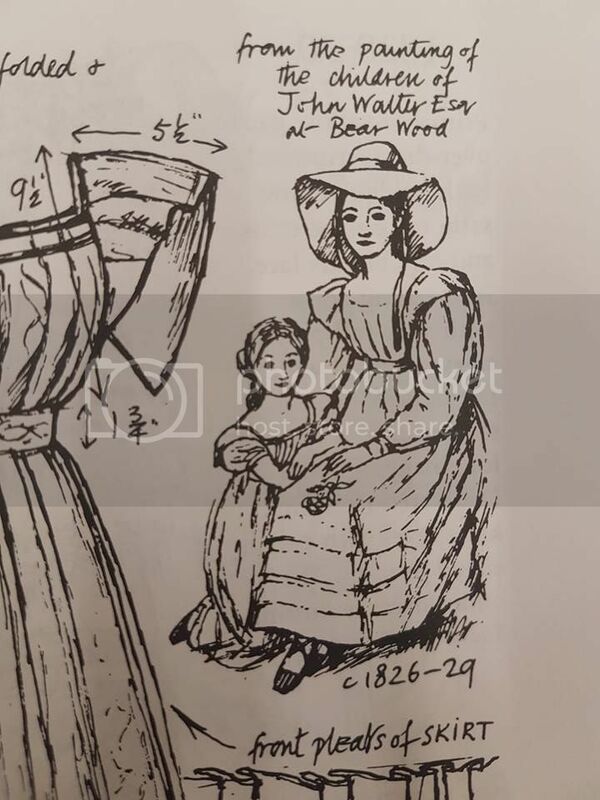 I can’t say I haven’t but then I can’t say I have… Here’s a blog post showing the existence of such sleeveless overgowns in the Regency era (1800s-10s), but that’s a lot earlier. Again, however, the waistline is lower and the bodice is much more fitted. This is a more grown-up look compared to the first two dresses. This next dress typifies how Molly’s style has changed by the end of the series. She’s wearing a more complex fabric — stripes and florals! — in a stronger color. Plus, she’s keeping the fashionable wide sleeve, lower waistline, and and added a lacy collar. Molly is all growed up in this red print dress. 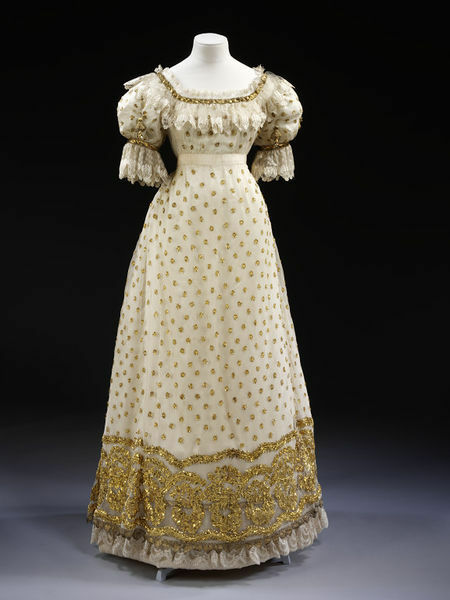 There was a big emphasis on the width of the shoulders in this era, and wide lacy collars (as well as wide pelerines) were used to emphasize this. Once again, you’ve got a lower waistline, fuller sleeves, and fuller skirts. 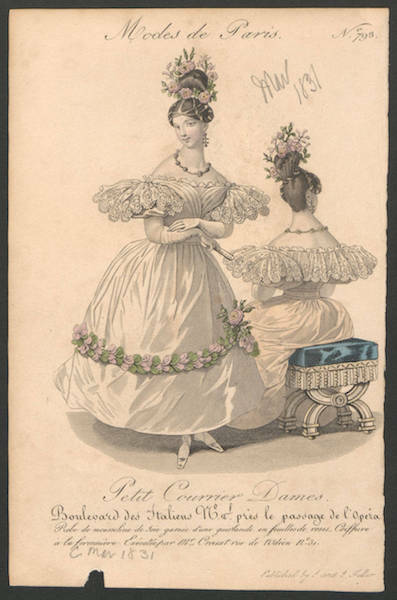 Petit Courrier des Dames, 1822 | Petit Courrier des Dames, 1829 | Modes de Paris, 1831. The dress itself isn’t really bad, but the other characters’ reactions show that they think it is! The two-puffed upper sleeve and high waistline are both VERY late 1820s — again, making the cut at least very old-fashioned. While the dress works fine in the series — the colors are louder than anything else seen on screen, and I don’t believe there’s anyone else in plaid — loud plaid dresses were fashionable in the period, so I always have to suspend disbelief. Compare the waistline placement, sleeve shape, and skirt fullness. 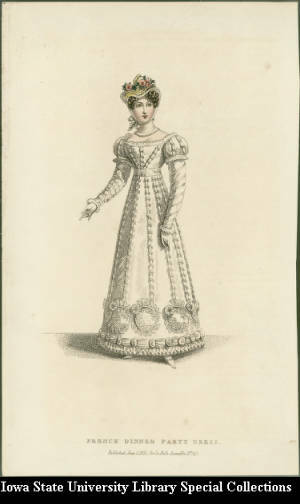 French Dinner Party Dress, 1821. Here’s an example of a double-puffed sleeve. Mid-way through the series, Molly and family attend a charity ball. This is the first evening event step-mother Hyacinth gets to oversee. Molly wears a very pretty white cotton dress with embroidered pieces on the sleeves. Interestingly, the narrow sleeve and high-ish waistline make it simpler and less fashionable than the dresses worn by Hyacinth and step-sister Cynthia, although it’s much improved in terms of taste. The skirt is also fuller than an 1820s gown would be. 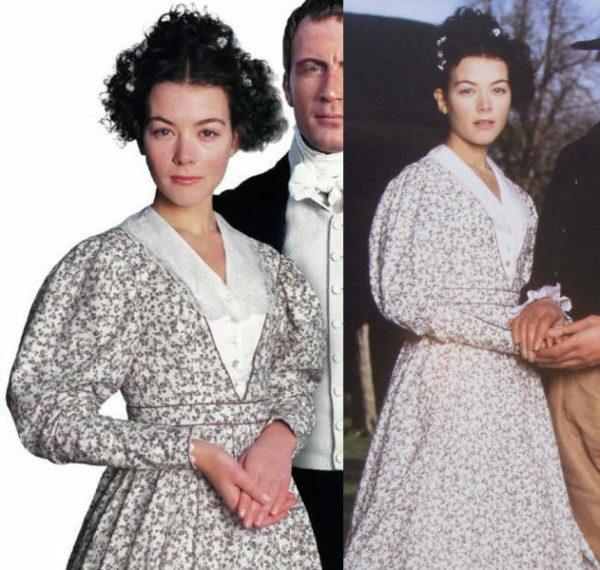 Again, Molly’s gown is much more along the style lines of the early- to mid-1820s — small puff sleeve, raised waistline — although the skirt fullness looks more late 1820s/early 1830s. Ball gown, 1820, Victoria & Albert Museum. It’s VERY pretty, VERY fashionable — and VERY bridal! 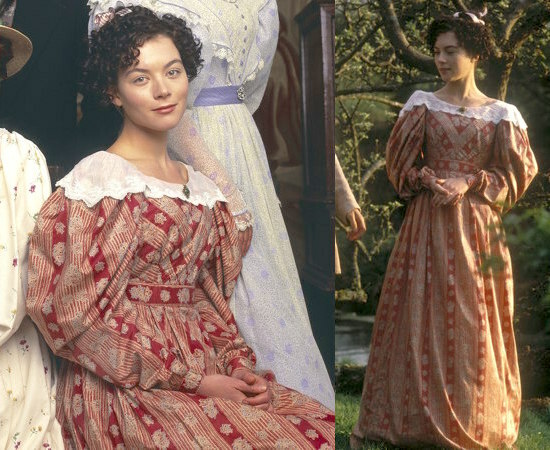 Okay, so Molly’s gown could use more petticoats, but otherwise compare it to the huge sleeves, wide lace collar, and natural waistline of this evening dress. Petit Courrier des Dames, c. 1831. What’s your favorite look worn by Molly in Wives and Daughters? The jumper question is very interesting. I can kind of see how such a design might carry on beyond the early 1800s/1810s particularly as it was such a practical style. Nancy Bradfield did draw a girl’s stockingette overdress which is almost a jumper, but more of a pinafore really, from the late 1820s. I remember she also showed a study from a painting of a girl wearing a similar garment but can’t remember which painting, it was from a family group portrait…. 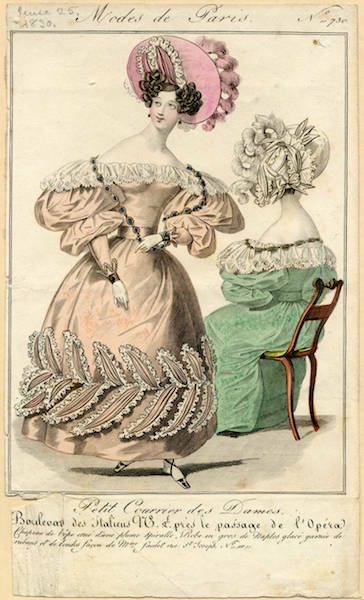 There’s this, from 1820 – short sleeved under-blouse, but not dissimilar in concept. Interesting, but that seems more like a gown with sheer sleeves, which is a different animal in my mind! Interesting, again! Still seems like a gown that had sheer sleeves to me. Definitely a strong possibility (and yes, bradford’s drawings are very reliable). I think the main difference is that none of these show the “blouse” other than the sleeves. The W&D jumpers are lower cut in front to show the blouse. Everything we’ve both found seems like a sleeveless dress (with, presumably, sheer sleeves or under sleeves). I loved Molly in the simple but elegant white dress she wore at the charity ball. Her natural honesty and practicality are best shown in her simpler gowns. Yes, they DEFINITELY connect Molly’s costumes to her character! 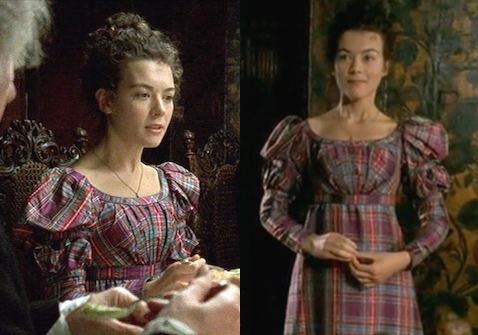 I always took the Hamleys reaction to Molly’s plaid dress as a particularly well done demonstration of the nuances in the relationship(s) between fashion(ability) and class in England. That relationship was not a straightforward, linear one from one end of the social spectrum to the other. There was a long tradition of the gentry deliberately eschewing the fashionability of the “ton” – part of the philosophy being that fashion does not always equal taste. High fashion was often viewed with suspicion by the gentry. They gently mocked the upper aristocracy for it, treating them like a spectator sport – just as the aristos mocked country gentry as being bumpkins. 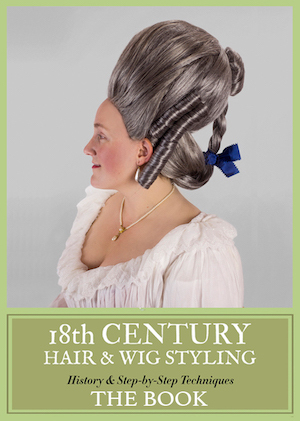 High-fashion was additionally often viewed as being too French for the English gentry. English aristos were closely intertwined with French ones, being related and visiting each other – much less the case with the English gentry, particularly those of “Saxon stock” such as the Hamleys. The gentry viewed themselves as the arbiters of decent, respectable, genuine taste and generally as a class left the fripperies of high fashion to the whims of their social “betters” and the follies of their social inferiors (namely those in the wealthier trades who were also often more fashion forward, being at the initial point of contact for novelties). I always admired this little detail of characterization of the Hamleys. They inhabit a complex place and position within English society – and I’ve always loved that they used such an atmospheric Jacobean pile for their house in the series! Good points and interesting background however the dress was supposedly awful, a reflection of Molly’s youth and inexperience in worldly matters. Rodger sees her as badly dressed and socially inept. Also the dress is not “fashionable”. Miss Rose’s is the classic provincial dress shop, at least a year behind in the fashions hence Cynthia’s sneer when Molly points the shop out to her. Molly’s poor choice of dress is a reflection also of her lack of female guidance. She had grown up in a male world dominated by her father and his medical students. Maybe that’s where the costume designer got it from, misinterpreting these images? Either way, pictures of real jumpers (if they are jumpers) are few and far between, so they don’t seem to have been common. Thanks for these! 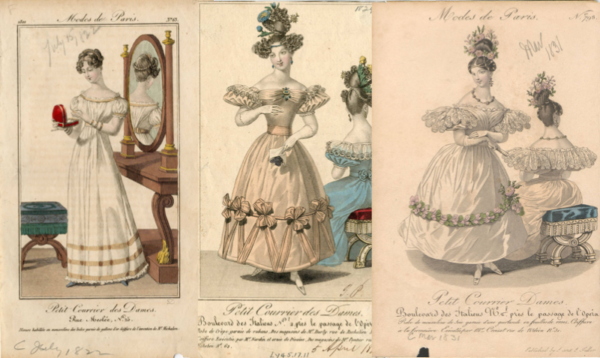 Some of them are maaaaaaybe’s, but yeah, I keep feeling like we’re looking at regular gowns with sheer sleeves/oversleeves rather than a sleeveless, low-cut-bodice-front overdress designed to show a “blouse” (chemisette). The fact that we’re scraping the bottom of the barrel tells me that these jumpers are a reach! I agree. But i feel that these quasi-jumpers that Molly wears achieves their goal: Showing how young and unsophisticated Molly is. The same way the sailor outfits in Sound of Music made the twenty something Charmaine Carr as Liesel look like a 16 going on 17. Yes, they definitely work theatrically! Molly’s tartan gown! You do love me! The reactions to it, and her father’s snarking about the tartan, are (naturally) one of my favourite parts of the series/book. Though you’re absolutely right — the one in the series is not nearly as garish or hideous as some of the surviving examples. This is Melanie from The Dashwood Sisters blog– thank you for the shout out! 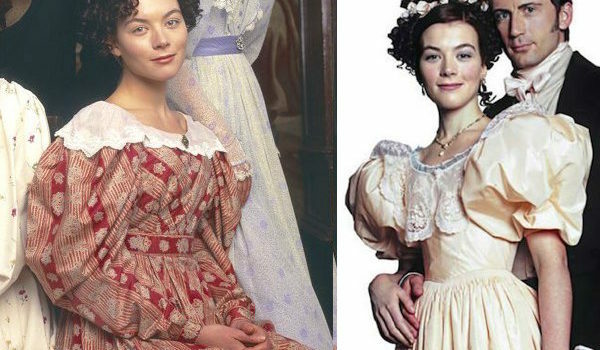 This post series is wonderful– I love all the work you’ve put into analyzing the costumes, both in the historical context and in the context of the character’s personalities and growth. Yay! Thank YOU for all your work screencapping all the outfits — it made it so much easier to write all of this! This comment is a bit late–but re: jumpers, I wonder what you make of this 1835 portrait of Léopoldine Hugo, 11 years old. Almost looks like an apron-y thing over a white dress. Some of the descriptions of the portrait say it was painted on the day of her first communion.